The Cardio7-S is a reliable, interpretive touch screen electrocardiograph (ECG/EKG) with spirometry. It features a large 7” TFT LCD touch screen with WiFi. It supports USB flash drive, a QWERTY keyboard, JPEG/PDF file format, one channel long-term recording, and storage of up to 200 ECGs and PFT tests. It stores and shows the recent 5-minute full channel ECG in order to print out the missed abnormal ECG waveforms. It prints in multiple formats, including 12/6/3 channel ECG reports, and FVC/SVC/MVV pulmonary test reports. It can be connected to PACS server through DICOM 3.0 and send the ECG and spirometer test reports to the server. The Cardio7-S is a reliable, interpretive touch screen electrocardiograph with spirometry. It features a large 7” TFT LCD touch screen with WiFi. It supports USB flash drive, a QWERTY keyboard, JPEG/PDF file format, one channel long-term recording, and storage of up to 200 ECGs and PFT tests. It stores and shows the recent 5-minute full channel ECG in order to print out the missed abnormal ECG waveforms. It prints in multiple formats, including 12/6/3 channel ECG reports, and FVC/SVC/MVV pulmonary test reports. It can be connected to PACS server through DICOM 3.0 and send the ECG and spirometer test reports to the server. Stores up to 200 ECGs in internal flash memory. The saved ECGs can be converted to various standard file formats, like JPG, PDF, XML, MFER, and DCM, and exported to external USB flash drive. The Cardio7-S sends ECGs to PC by using BMS-Plus Windows-based PC software through LAN or WiFi. It supports DICOM 3.0 protocol to retrieve work lists from PACS and save ECG images to PACS. USB flash drive can be used to move ECGs stored in Cardio7 to PC. Cardio7-S acquires 10 full seconds of ECG data simultaneously from 10 leads to produce an accurate 12 channel printout with analysis. Cardio7-S provides the pulmonary function tests, including: FVC (Forced Vital Capacity), SVC (Slow Vital Capacity), and MVV (Maximum Voluntary Maximum). Pre-post bronchodilator comparison is supported. With disposable mouthpiece, no cleaning and sterilization are needed. Cardio7-S stores and shows the recent 5-minute full channel ECG in order to print out the missed abnormal ECG waveforms. The ECG printout offers detailed interpretation information in text/guide/vector report format to aid in diagnosis. Provides 12 channel, 6 channel + 1 rhythm, 3 channel + 1 rhythm, and 3 channel + 3 rhythm reports. Supports pediatric interpretation. Cardio7-S produces full size A4 printouts in 1, 3, 6, and 12 channel formats and FVC/SVC/MVV test formats. Full size printouts improve readability and make it easier for filing in the patient chart. BMS-Plus is a software program that enables you to interface Cardio7-S to Windows-based computers through LAN or WiFi. The ECG and PFT data from Cardio7-S is saved in either Bionet’s proprietary file format, JPEG or PDF. The JPEG file format ensures compatibility with most EMR packages. 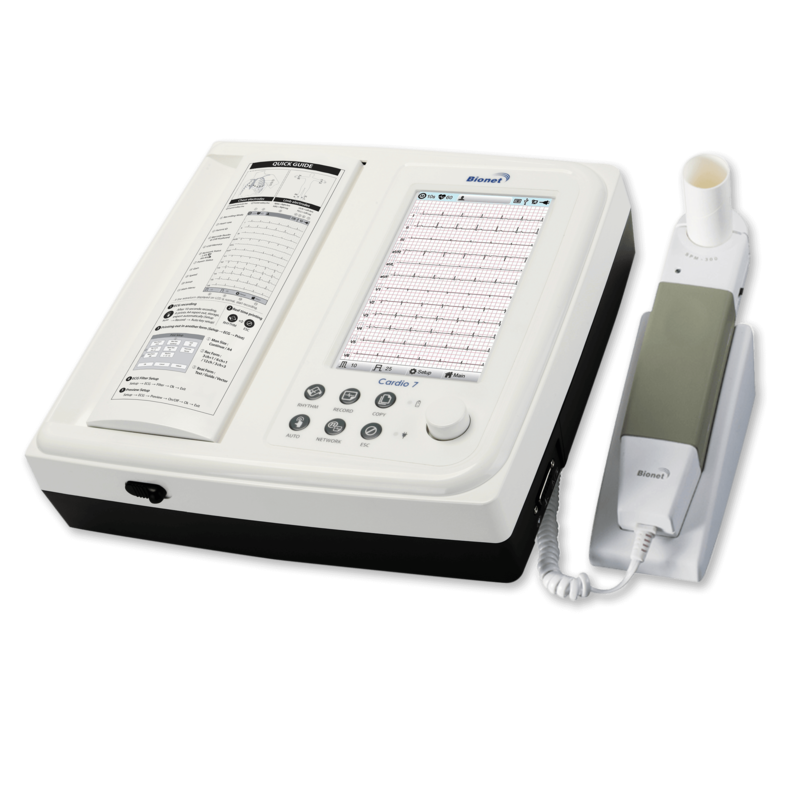 BMS-Plus displays real-time ECG data on-screen, instantly performs a full set of measurements, and offers diagnostic aid. In addition, BMS-Plus can eliminate the need for costly thermal paper by printing a variety of comprehensive reports on standard printer/copier paper. Cardio7 Main Unit, SPM-300 (Spirometer), 10 Lead ECG Patient Cable, Alligator Clips, Electrodes, Medi-Graph Paper, 100 Disposable Mouthpieces, 1 Nose Clip, Hospital Grade Power Cord, Operation Manual, Diagnostics Guide Book, Quick Reference Guide and 4-Year Warranty Card. WiFi USB dongle and USB Flash Drive with BMS-Plus Software Included.